Pictures of space are often gorgeous. But one of the most exciting things about them is that, very often, they show us things that are invisible to the human eye. This picture in particular does that. 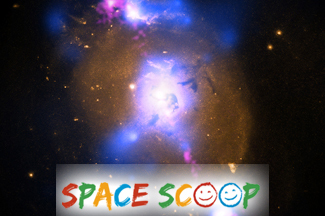 In the middle of the photograph lurks an invisible monster, called a super-massive black hole (http://www.unawe.org/kids/unawe1116/).To make this invisible object even harder to study, it is hidden under a thick cloud of dust at the centre of its home galaxy! Even the bright blobs of colour you can see are patches of light that our eyes cannot detect naturally. The pink colour shows radio light, and X-rays are shown in blue. A black hole is anything but empty space, don't let the name fool you. It is a huge amount of material packed into a very tiny area - this one has about 100 million times the mass of our Sun! Anything that wanders too close to a Black Hole is pulled into it with no chance of escape, including light. This is why we cannot see black holes, they are invisible even to telescopes that detect X-rays, radio waves and other types of light. The only way we can spot black holes is by detecting its effect on other things. For example, in this picture, the brightest blue patches, along the edge of the galaxy reveal where a high-energy jet has ploughed into clumps of galactic dust. 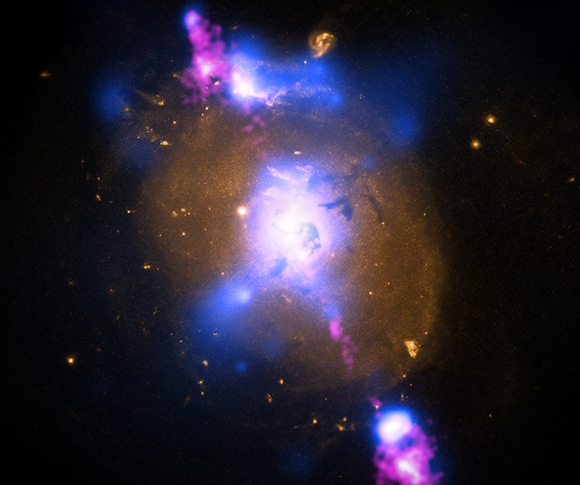 The jet was made up of particles that were heated as they were pulled into the black hole. This gave them energy and sent them speeding away from the black hole at millions of miles per hour! Two similar jets can be seen in pink, shooting to the North and South of the galaxy. Cool fact: Black holes aren't the only things in our Universe that are invisible to us. Astronomers are yet to solve the mystery of the invisible "dark energy" and "dark matter" that combined make up almost 97% of the Universe! In fact, less than 5% of the Universe is made up of "normal" stuff!